its actually not that bad. its definatly worth it with a amp. but for the stock amp you can hear the difference but not nearly as much with a new amp. 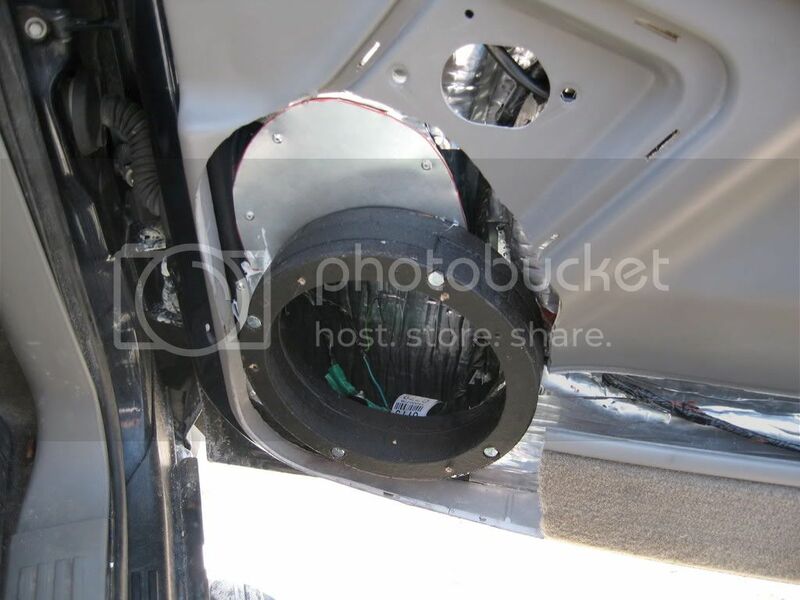 Well if your OEM speakers blew once, then no point in getting another set that's just going to blow again. Sometimes I wish my whole Bose system would blow so I could have an excuse to replace it all. Its not really difficult. If it were me I would buy a 4 channel and a pair of components. There are usually 3 mounting options with the tweeter. Flush, surface, and angled which will help get the driver in the door or A Pillar whichever you prefer. Then a pair of coaxes off the other 2 channels in the rear doors if you want passengers to experience the tunes. Never mind the D Pillar speakers that was dumb. This would be the simple replacement and you would find it to be quite nice I think. If your looking for subwoofer that is the next step. New to the Forum here guys.....Getting a 02 Tahoe from my parents this weekend (I am buying it from them) and will soon after that get started on the audio. I hope I am not thread jacking....just figured since we are going to be doing the same things here I would chime in and get some questions answered....it might help us both. I would consider myself a audio Veteran......I have been a contributing member of several audio forums....The old SoundIllusions.net was my home...that was about 4 years ago.....Caraudio.com....elitecaraudio.com.......et c.
So i like the think I know what I am doing even though I have been out of the audio world for about 2 or 3 years....I am kind of rusty. Well I am going to being changing out the stock radio real quick with a Older Alpine CDA-9815....it was their flagship model about 4 years ago....still works like a champ.....for the Comps up front I am going with some Phoenix Gold RSD6.5's.....I normally wouldn't go with PG comps but these are getting rave reviews on Caraudio.com and for only $87 shipped on ebay I had to try them out. The sub is going to be a Arc Audio 12D2 that will be going into a sealed 1.25 cubic ft. box that I will be building and carpeting to match the interior as close as possible. Lastly I will be powering everything with a Older AutoTek MM100.4 which will send 100 watts to the comps in the front doors and 300 or so watts to the sub(with the rear channels of the amp). I am not worried about the rear speakers at the time....replacing the stock HU will make them sound better but I will be fading the sound to the front unless I have rear passengers complaining. 1. Tweeter mounting up front.....plan is to keep a stock look and not have to do any cutting what so ever....so where the stock tweeter is now, I can just mount the after market tweeter there correct? I remember the stock tweeter having a funny looking shape to it....any kind of mod need to be don there? 2. I have seen amps before mounted underneath the rear seat....is there plenty of room under there for an amp? Seems like a great place for one. 3. Is the dash hard to take off when changing out the stock HU? Any special instructions there? What is the best or a good dash kit to use? 4. When Taking off the stock door panels to change out the speakers...so there is 3 or 5 hex screws? And once those screws are out just carefully pry the panel off? Are they plastic pins that hold it on? I am great at breaking plastic pins. That is all the questions I have for now.....sorry if I thread jacked....thanks for the help in advance. 1. Is the tweeter in the A Pillar or door? If your going in the door the flush mount option on the tweeter should work when the stock one is removed. I think the A Pillar has the curvature which may cause a problem with the flush mount. You could McGuyver it behind the little grill though. The grill on the door is tabbed at the back of the panel also. Without the grill this is what the tweeter spot looks like. 2. Plenty of room for an amp under there. I have 2 of them going there. MDF base and your good. 3.Easy job. Pops right out. Just turn the key on, tilt all the way down, and column shifter all the way down. Work it from the top out. The Scosches are fine for kits I think. 4. Remove screws. Take the little sail panel off. The door is pin proof! There is just a little bracket type deal behind the door lock that you have to finaggle a little bit. Then the door panel pops off with a up and out motion. Thanks for the reply WrenchGuy....you over on Ca.com right? Yea the tweets are in the door and that is where I am going to put them.....Hopefully this little set up will sounds nice with a little pop to it....just a little is all i need. Yeah I'm over there too. The RSD's should do good. I would do a little deadening behind em though. Some good door treatments will get you that accurate "pop" your after.